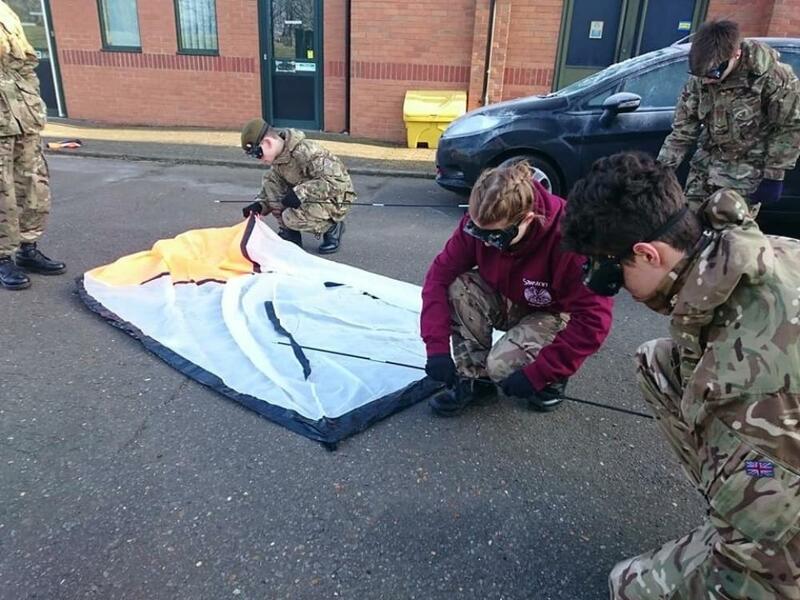 Despite the predicted freezing temperatures 32 cadets arrived at Waterbeach Cadet Training Centre laden with warm clothing ready to take part in the second CVQO ILM Level 2 Young Leaders Award course. 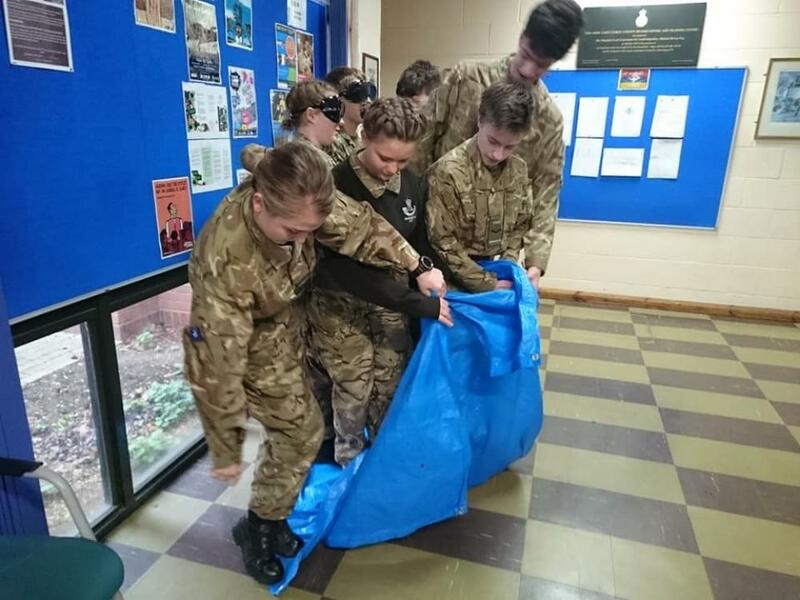 As we were sharing the accommodation with a local Reserve Unit the Friday night briefing was not just about fire safety and who the Senior Cadets for each dorm were but emphasised what was expected of their behaviour for the entire weekend. All were advised what the course entailed and how the trainers would interact with them. 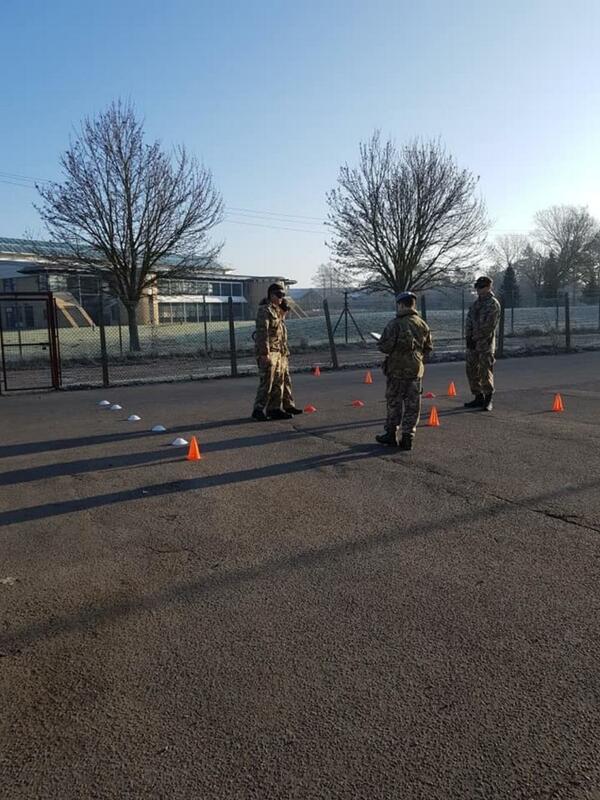 On Saturday morning the course trainers arrived to set up their training rooms for the course just as the cadets were finishing their breakfast. 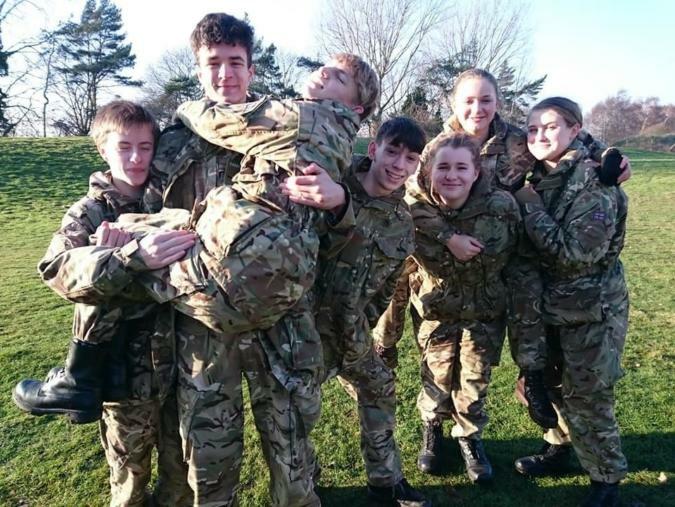 As soon as the duty group had cleared the cookhouse everyone met in the Conference Room with Pete Spink, Matt Stewart, Stuart Hoare, Sarah Kelly and Sharon Denson. Then following the initial form filling everyone was split into five sections; two went with Matt and Sharon to the IT Suite, the remainder staying in the Conference Room with Pete, Stuart and Sarah. 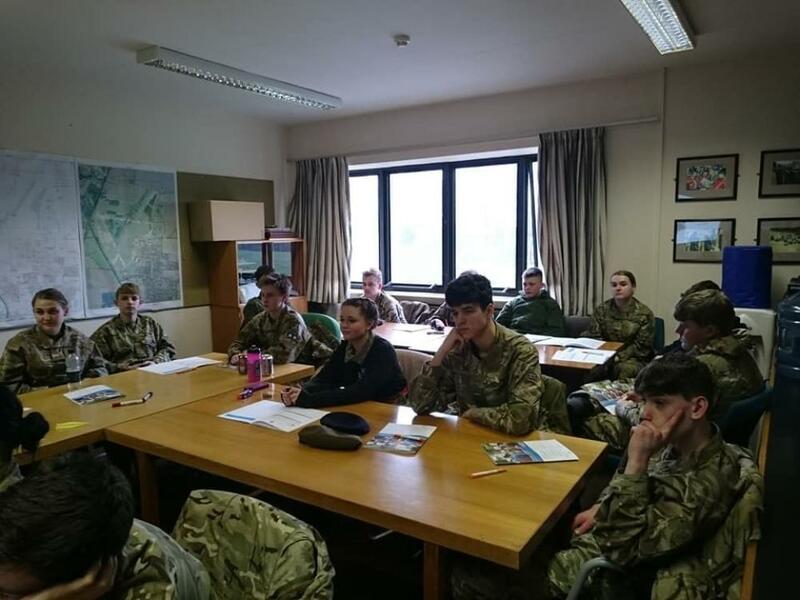 Then began the formal part of the training with the cadets starting on their workbooks discussing words that would best describe an effective leader and who they considered to be a good leader, either someone famous or someone known only to the cadet; someone who had been an influence in their lives. 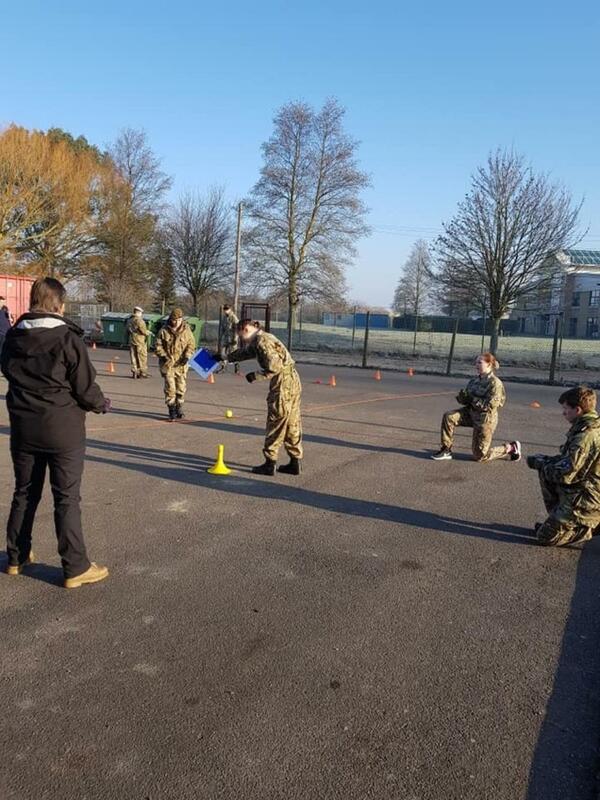 Interspersed with completing their workbooks the cadet sections challenged some command tasks that could be carried out indoors as the outdoor temperature was below freezing. 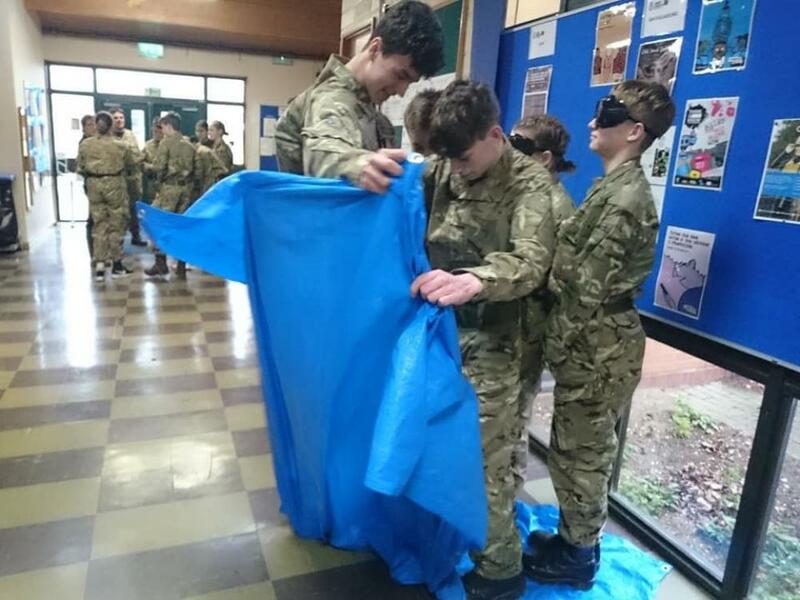 Shortly after a nice warm lunch three of the sections went outside for a bit of fun; cadets making a circle and Pete demonstrated how different animals/birds made their noises/moved about; then the cadets were blindfolded. 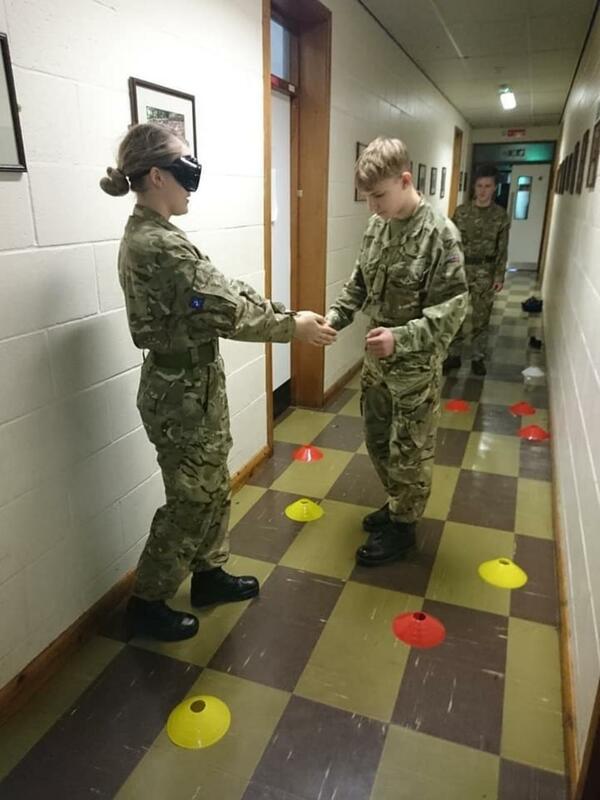 Pete crossed the circle several times selecting different pairs of cadets to become said creature and copy them. 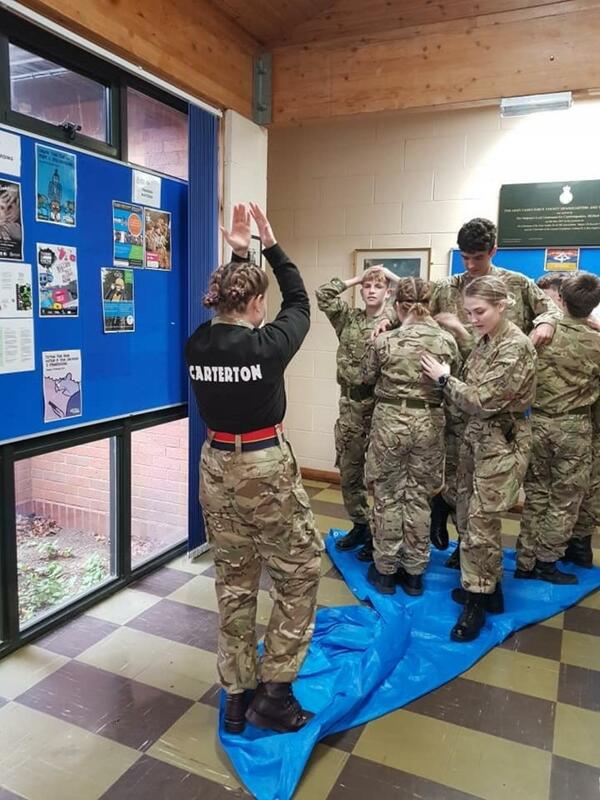 It was very amusing watching cadets flapping their elbows and “clucking” or barking/meowing etc. trying to find their other half. At least the “snakes” were not slithering around on the ground! 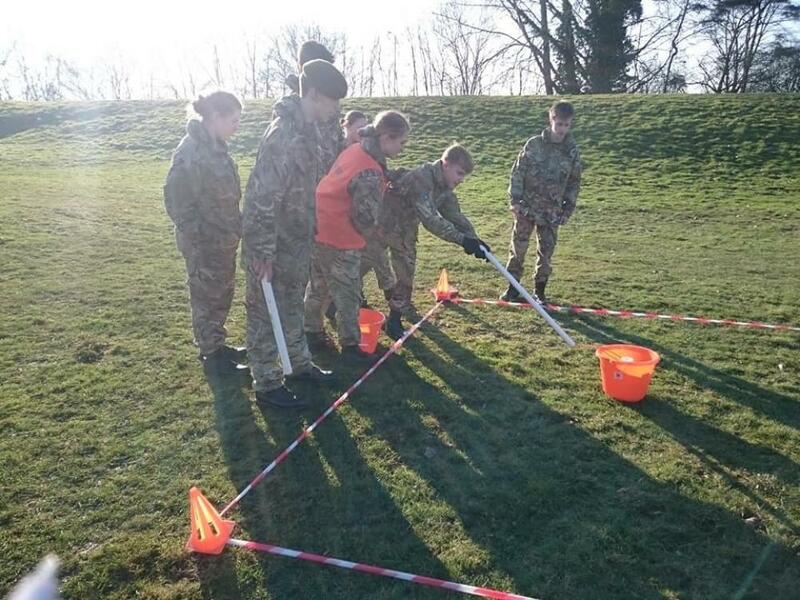 The sections returned inside and alternated completing parts of workbooks with command tasks with a different cadet selected to take control; as each command task was completed the other cadets wrote their comments regarding how well the task had been completed. 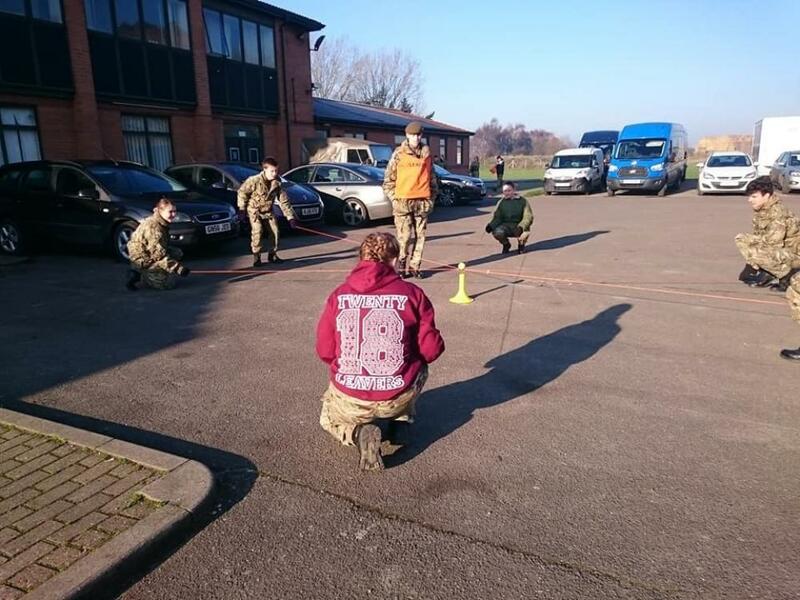 Ultimately all the cadets had to be the leader of their section during one of their tasks. 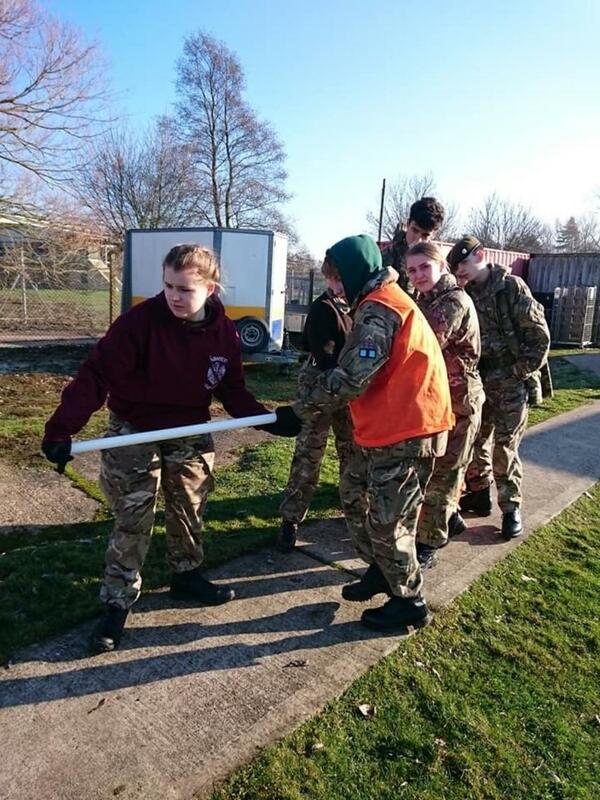 On Sunday the cadets had a surprise lie-in until 0800hrs but it meant that as soon as breakfast was over the pressure was on to get all the work completed in time before finishing in the afternoon. 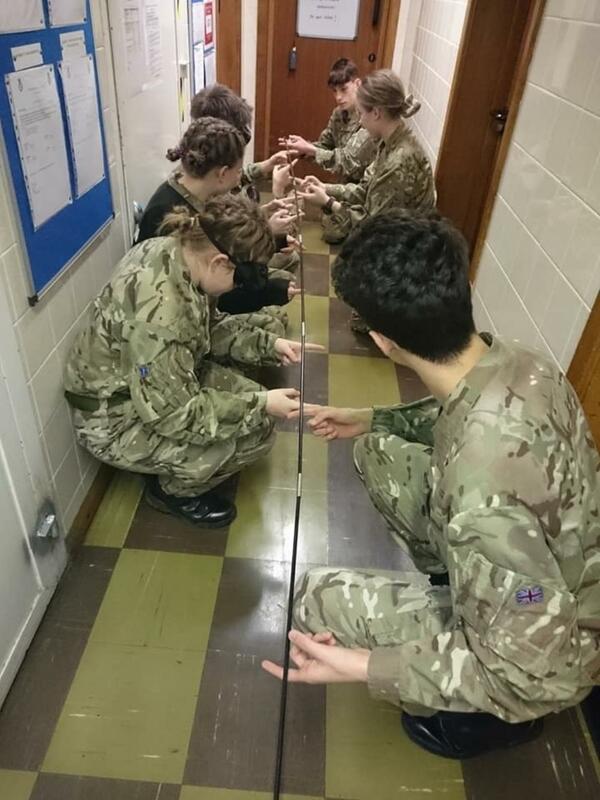 As the outdoor temperature on Sunday morning had dropped to minus 5 degrees we opted to use the downstairs corridors and main foyer for the larger indoor tasks with “The Beast” [tower build similar to a marble run] being completed in the RSM office. 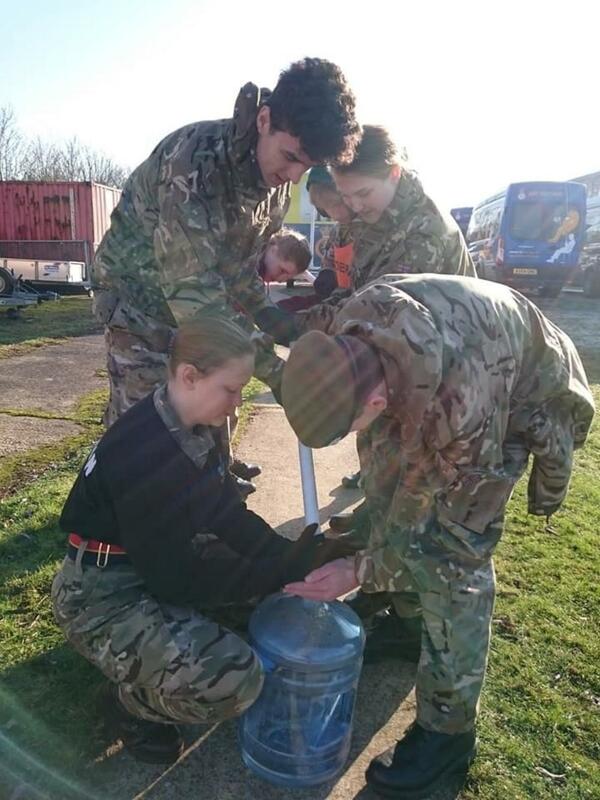 As the temperature improved in the afternoon other tasks were completed outside. 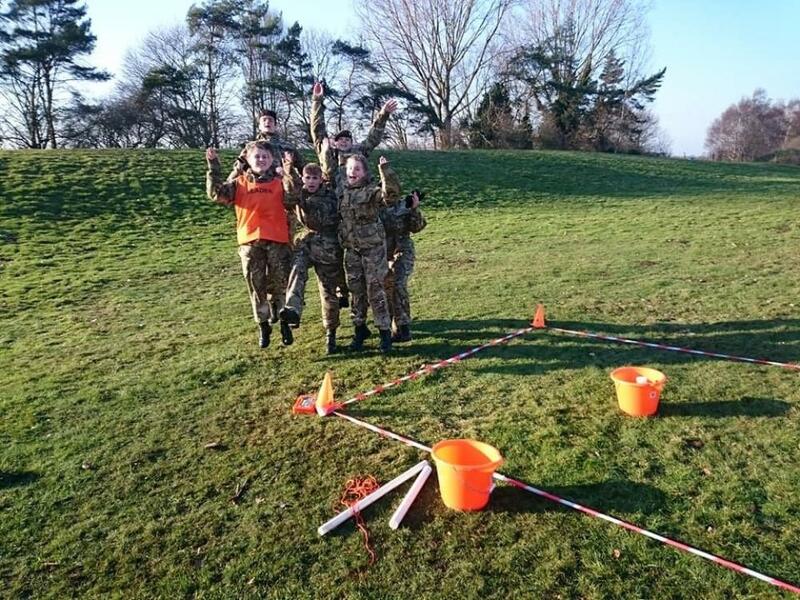 The weekend ended with the course photograph taken by an “IT whizz” cadet from Talavera Detachment, using the course trainers’ phone cameras, ready for them to “tweet” on the CVQO site. 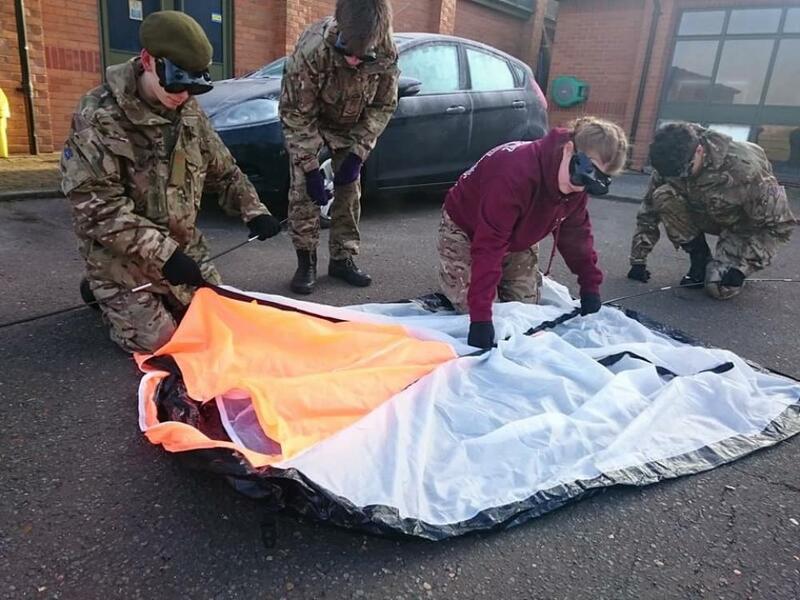 In just over a month all the results should be back; hopefully CVQO will return in May/June to run another course for us.